Unlike other holidays, Thanksgiving can be tough on kids with expectations of sitting still, hugs from distant relatives and quirky food, like green bean casseroles, and candied yams, that is only served once a year…and oh yea, no presents. With *75% of American families claiming to have at least one picky eater at home, Kraft Mac & Cheese is one thing parents can rely on to please their picky eaters. A video showcasing Kraft Mac & Cheese for Thanksgiving is available on YouTube.com: https://youtu.be/RWj0vA_ivG0. Kraft Mac & Cheese products are available at retailers nationwide starting with a suggested retail price of $.99. Contact your nearest store for availability. 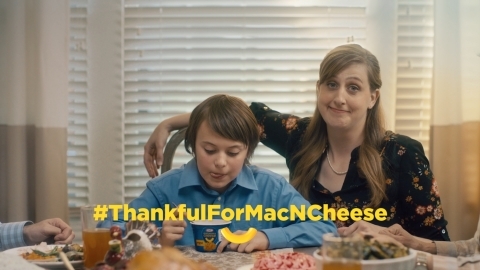 Share your thanks for Kraft Mac & Cheese using #ThankfulForMacNCheese on Twitter @kraftmacncheese, Instagram @Kraft_MacandCheese, and Facebook @KraftMacaroniandCheese.